Clouds hung heavily in the sky, mercifully shading us from the searing sun while we waited. Beneath the clouds our desired subjects flew in wide graceful circles, using thermals to scope out the carcass on the ground below. Vultures flew in swiftly from other reserves and seemed determined to join the party. On the ground, lines of foot traps had been laid beside the carcass. We watched from a distance, keeping a close eye on the traps so the capture and release could be carried out as quickly as possible. The vultures circled above us and we continued to wait patiently. 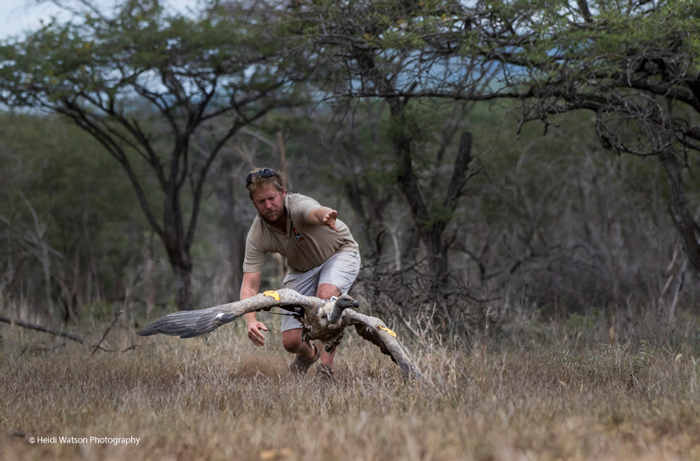 We had joined Andre from Endangered Wildlife Trust and the team from Wildlife ACT to capture vultures near Rhino River Lodge on the Zululand Rhino Reserve. 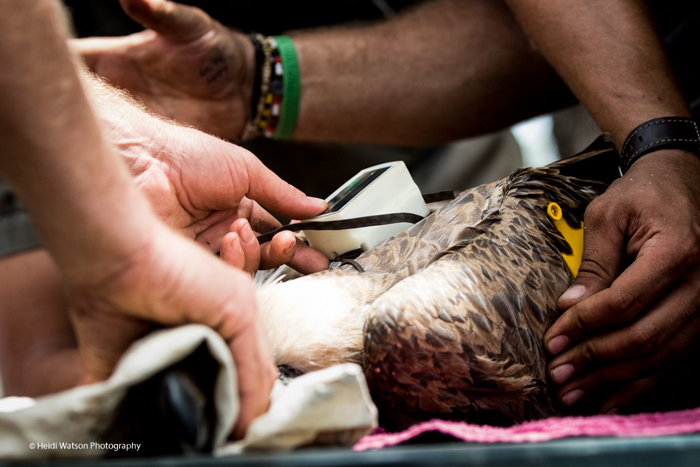 This was part of the Zululand Vulture Project – a conservation partnership between EWT, Wildlife ACT, and Ezemvelo KZN Wildlife. 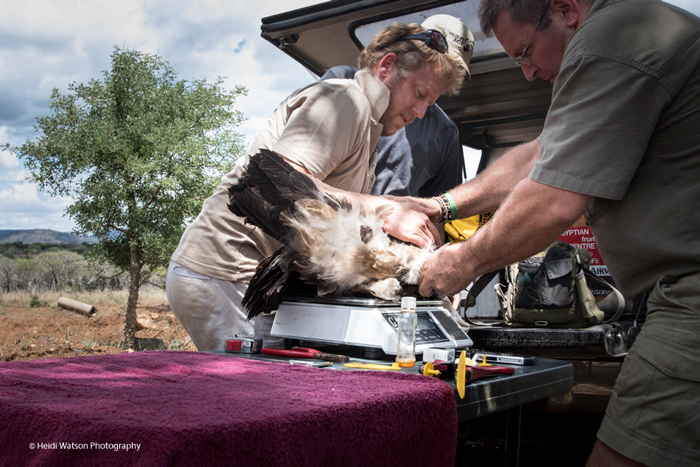 The goal for the day was to fit vultures with GPS tracking units along with tagging, ringing and measuring the captured birds. 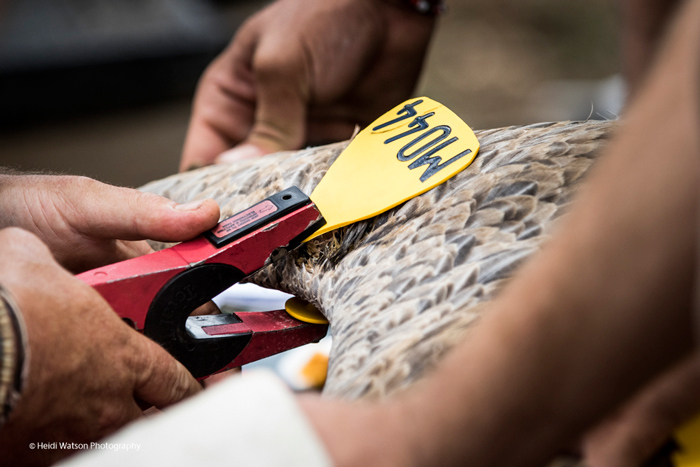 The information garnered will help to monitor the vulture population and measure the success of conservation activities. 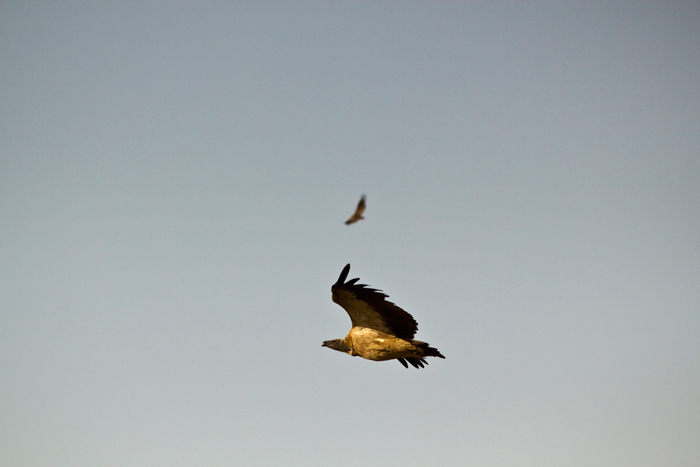 Six of Africa’s 11 vulture species occur in the Zululand Rhino Reserve. Most commonly seen are the white-backed and lappet-faced vultures, with rarer sightings of the hooded, white-headed, palm nut, and Cape vultures. In 2015 five of these six species have seen their conservation status worsen. 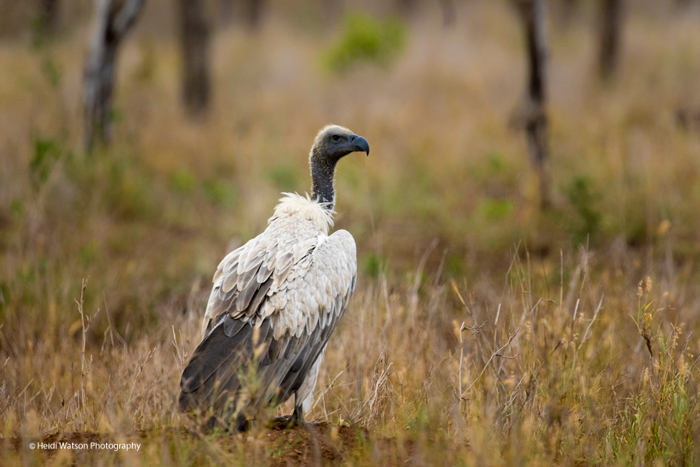 The lappet-faced and Cape vultures are now classified as Endangered, while the white-backed, white-headed, and hooded vultures are all classified as Critically Endangered, which is the highest level of threat that the IUCN can assign a species. 1. Indiscriminate poisoning (usually aimed at other species like predators that kill livestock). 2. The use of vulture body parts in traditional medicine. 3. Deliberate poisoning or killing by poachers because they give away the location of larger animals, such as elephants or rhinos, that have been poached. As we continued to look to the skies, the vultures began to descend. For a bird that is so graceful in the sky, on the ground they hobble and hop, squabbling amongst themselves, vying for a spot on a carcass. It is a comical and delightful spectacle to behold, although it is set on a solemn stage of the death of an animal. 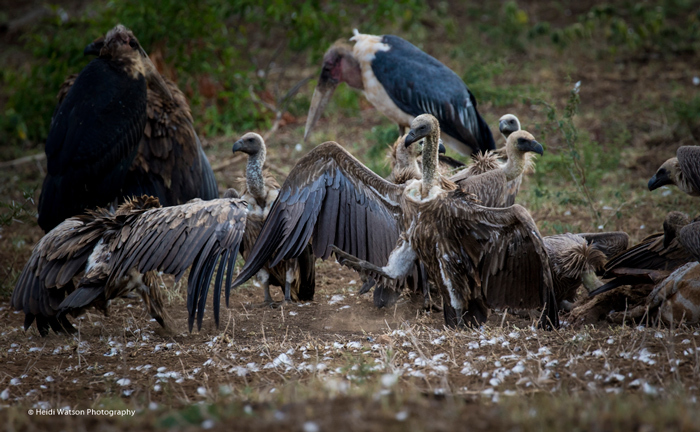 The vultures’ role in the circle of life should not be underestimated. 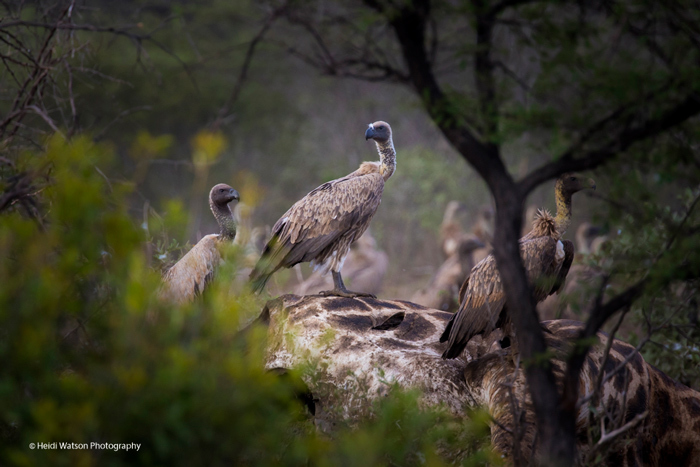 Vultures are the cleaners of the African bush, and play a vital part in stopping the spread of diseases. In total, three white-backed vultures found their way into the foot traps. Chris from Wildlife ACT and Andre from EWT raced ahead safely to get hold of the birds and remove the traps from their feet. After that we joined them to assist with taking measurements and fitting the GPS units. 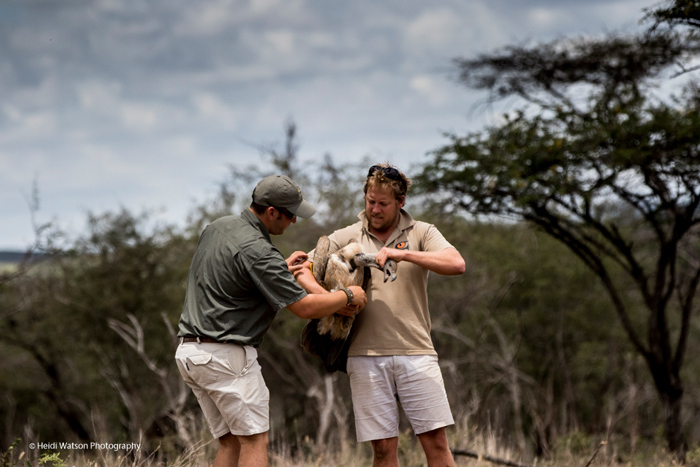 Holding a vulture is no easy task, with a beak that can rip through a carcass the danger in handling these animals is real. 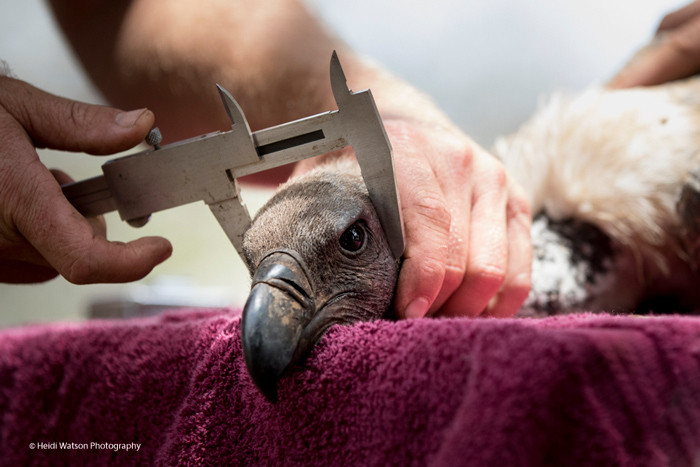 The three captured white-backed vultures were then released, and the Zululand Vulture Project will continue to monitor their movements. Rhino River Lodge is committed to protecting the land and ecosystem that is so critical to the vulture’s survival. 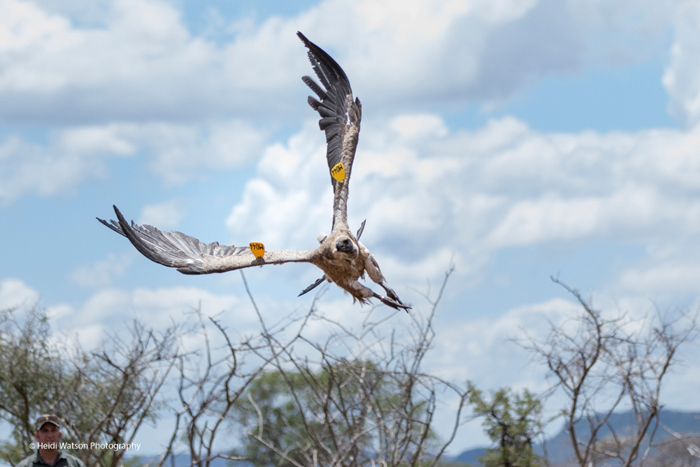 We hope to always see skies filled with vultures circling, trees heavy with perched vultures, and the entertaining sight of vultures feeding on a carcass, playing their critical role in the circle of African life.